It's an ordinary writing session in the local café—until the writer accesses the network. Uncle Brim is in love with a painting; Carmen is in love with her Uncle Brim; and it is all about to go up in flames. A woman is irreparably changed by her heart transplant. Everyone has a different idea about what is floating down the river. Where can you find protection against schoolyard cruelties? A man asks his neighbor for an unlikely gift ... in Tupperware. Alice's family gathers to bury her first husband—again. Adopted, Chinese, Jewish and 13 ... Oy and aiya. Sometimes it's hard to find the right words. Some things just have to be lived to be understood. Art. Land use. Gentrification to the extreme. Dad may have more in common with the forest than anyone realized. A comedy about the dead and where they should be buried. What does it mean to be a man in the face of tragedy? Miss LaCoeur wants red beans and rice, but trans-fat-laden french fries are what she needs. Girl meets boy—and his unusual companion. One night in the basement of a Brooklyn brownstone, three prep school boys tackle life's biggest questions about race, wealth, weed and who really owns hip-hop. 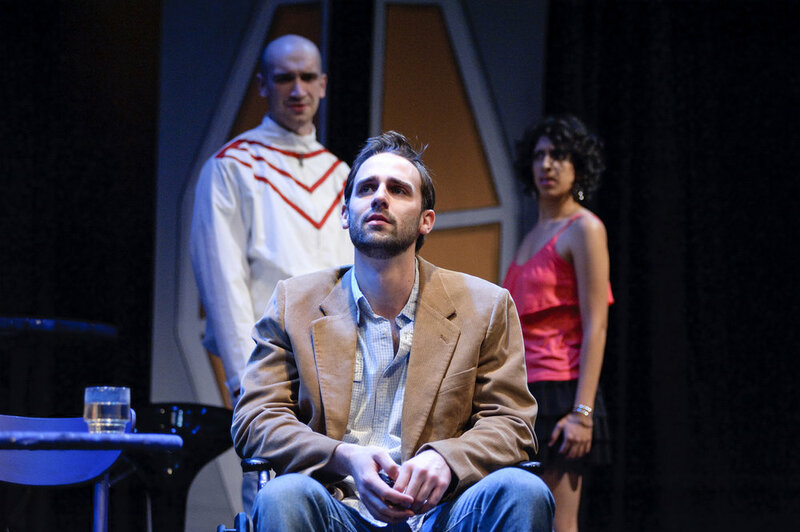 Sharp, witty and honest, Aaron Wigdor Levy's play leaves no easy answers. On a rainy night in a spaceship bar, Rocketman buys drinks from an astronaut and contemplates making a phone call that could change the fate of the universe. Sean Graney, Founder and Artistic Director of Chicago's The Hypocrites, takes us on a beautiful journey to a lonely place. When her younger sister goes missing, Sam's family falls apart. Emily Schwend invites us into a world where soap bubbles overflow the sink, a yellow raincoat is spotted in the most unlikely of places and the whole world has to be re-assembled, one toothpick at a time.